On Tuesday, 15 December, the republican candidates vying for their party's nomination for the 2016 U.S. Presidential election gathered in Las Vegas, Nevada in their fifth debate to date. The above image shows Marco Rubio, Ben Carson, Donald Trump and Ted Cruz at the commencement for the singing of the National Anthem. It is often speculated as to why paintings Napoleon Bonaparte often shows him with his (right) hand in his vest or jacket. While some say this was due to a chronic stomach ailment (many think he died of stomach cancer), or the relative difficulty portraitists had in painting hands - however in the 17th and 18th centuries it was a custom for men of higher sociology-economic classes to pose in such a manner. It was widely interpreted as a "manly boldness yet tempered with modesty". Thus the hand-in-vest pose was an alpha-beta hybrid of the era. Most who know history consider Napoleon a very skilled general - but also a megalomaniac, and since so many people associate this (and similar illustrators) so strongly with Bonaparte - one would be well advised NOT to emulate him. Yet there is another reason - that is hardwired into the human brain. Take note of Ted Cruz's hand placement INSIDE of his jacket. There is an extremely strong human instinct to be suspicious those who hide their hands. This lack of trust is particularly true at strategic/key moments. A common variation of this behavior is inserting hands into one's pant (or jacket) pockets when a question is asked. This should raise a red flag. At the very least such behavior would indicate a significantly heightened anxiety level - and depending on the other nonverbals with which it is clustered, it very well could indicate a lie. 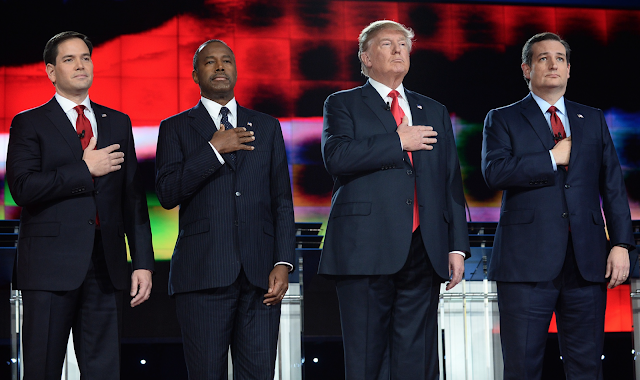 Even if Cruz were outside in Bangor, Maine in January - his hand should be outside of his jacket (and with no glove) during the national anthem, pledge of allegiance - and when shaking hands. What other candidate's body language in this image suggests a lack of sincerity?